Ruth’s cooking is improving, thank goodness! When I first came to St James all cooking was done on an open fire, a pot balanced on three stones with wood in the middle. 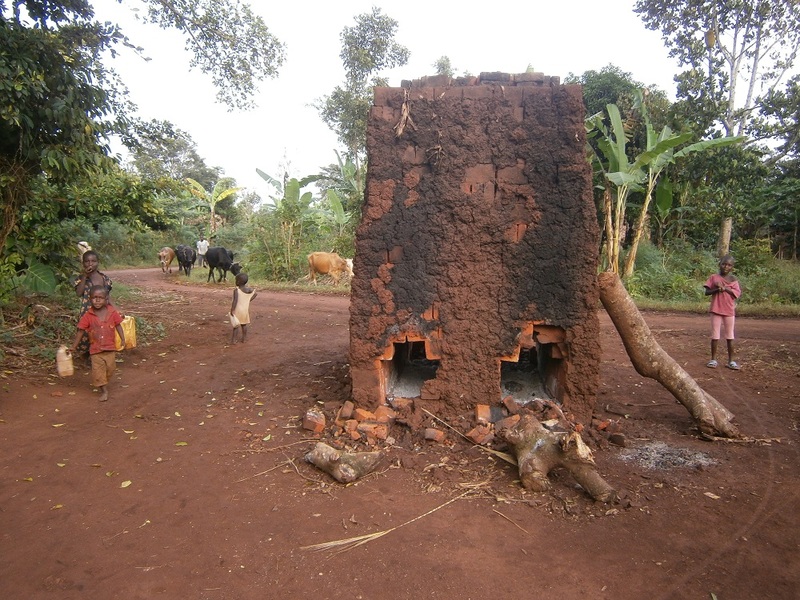 But of course when it rained as it has done recently the fire went out and everyone went hungry! 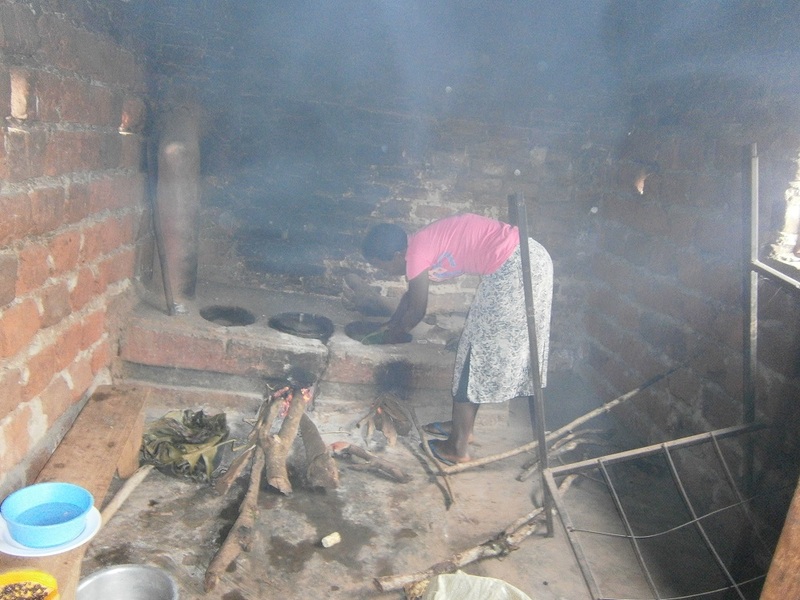 Now we have a small kitchen partly paid for by the parents, with a wood saving oven which is also supposed to be smokeless but its not quite that good but a great improvement. I can now stand in there without coughing my heart out and the health risk to those doing the cooking regularly has been reduced enormously! Maize as fresh as fresh! Most lunch times Ruth goes and picks maize and roasts it. 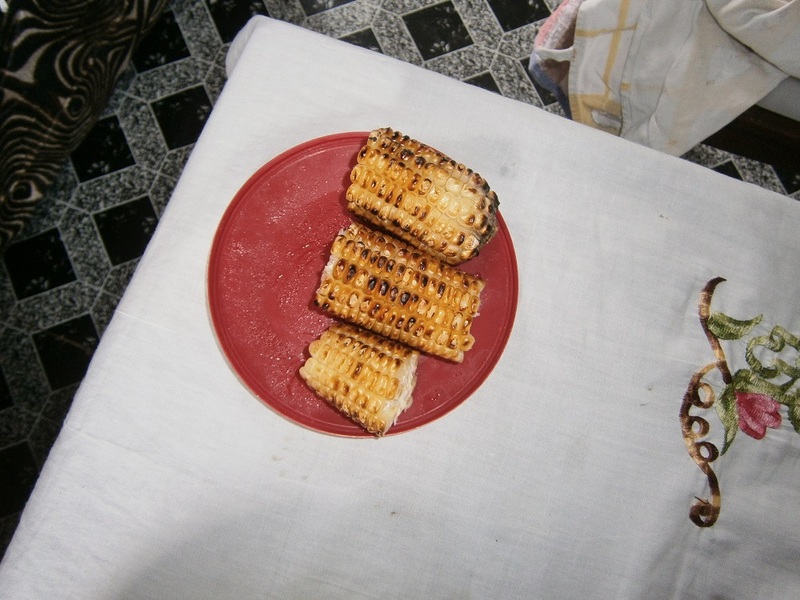 The maize is still fairly young so is relatively tender and actually delicious. 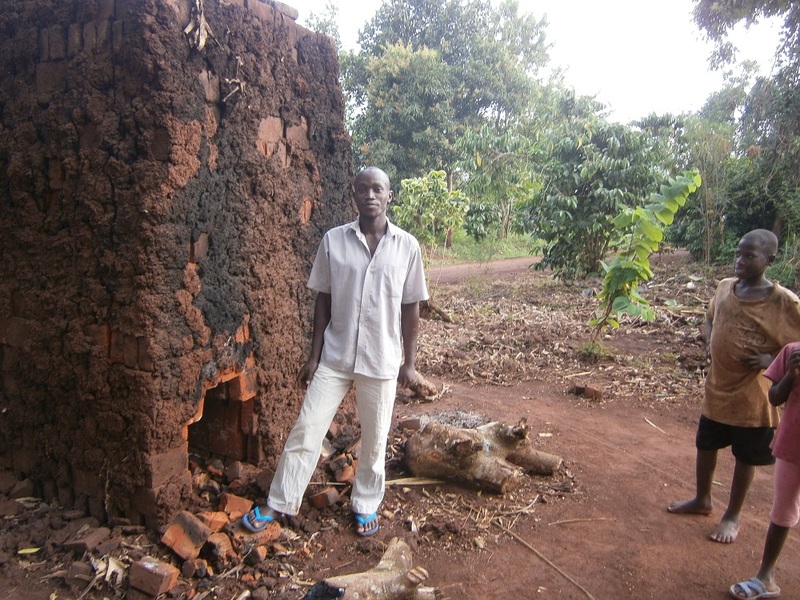 Bricks – As we have decided to build a bigger latrine block (more news later) we need to purchase additional bricks and a local man has just made some. 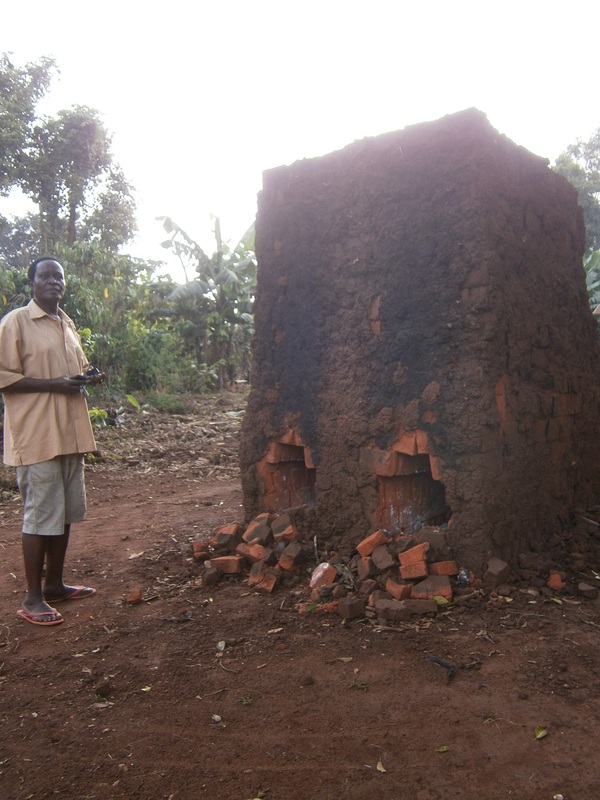 I walked with James to visit the brick maker, just up the lane from the school, and had a close look at the kiln where they had been fired. 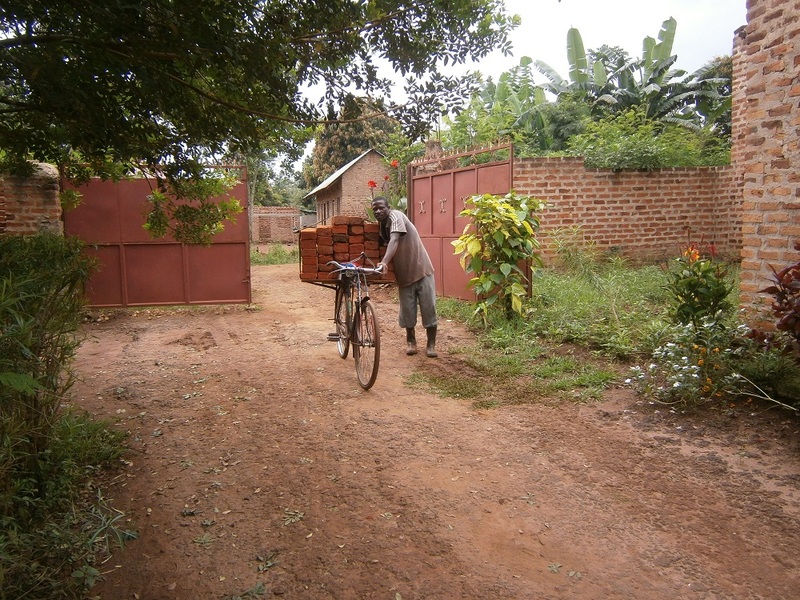 The bricks were ready so as soon as the man got a buy he would dismantle the ‘castle’ of bricks and they would be delivered to St James by a man with a pushbike! 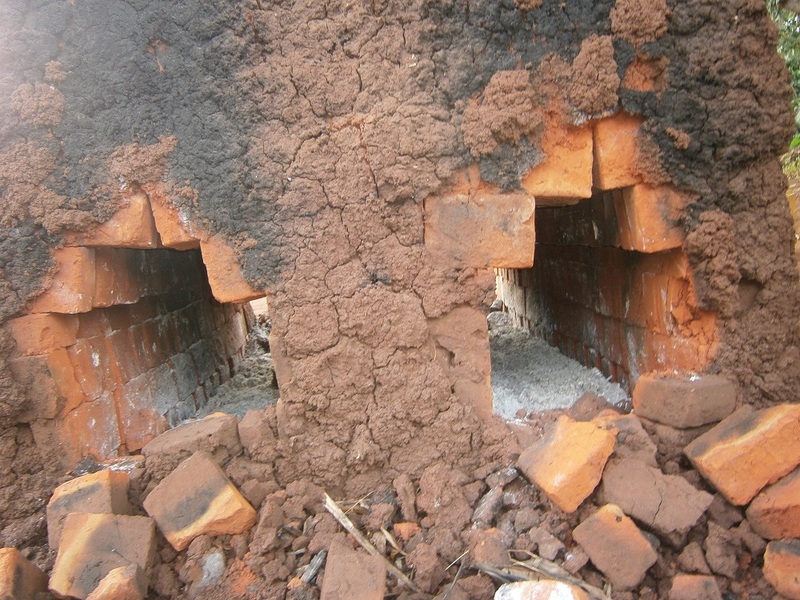 It kiln reminded me of the lime kilns in the Derbyshire Dales! 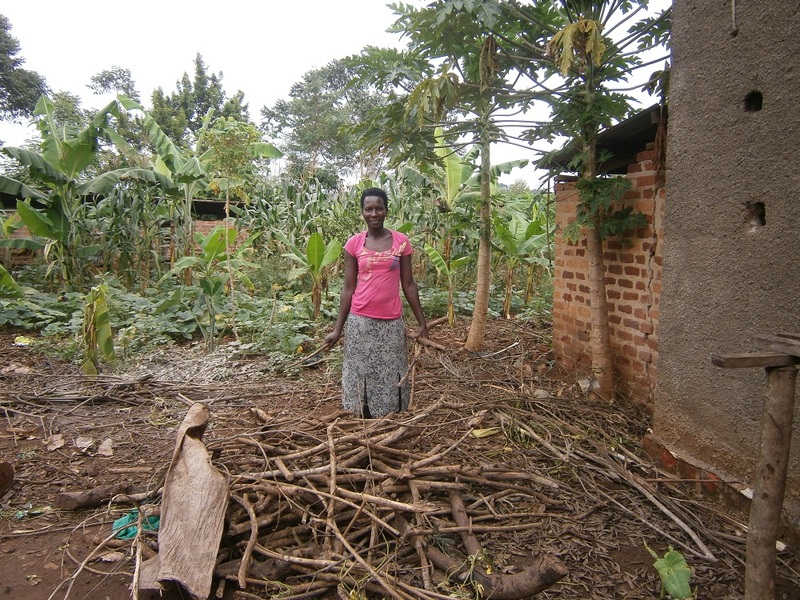 So much is being done the ‘old’ way here, earning small amounts for the families involved. 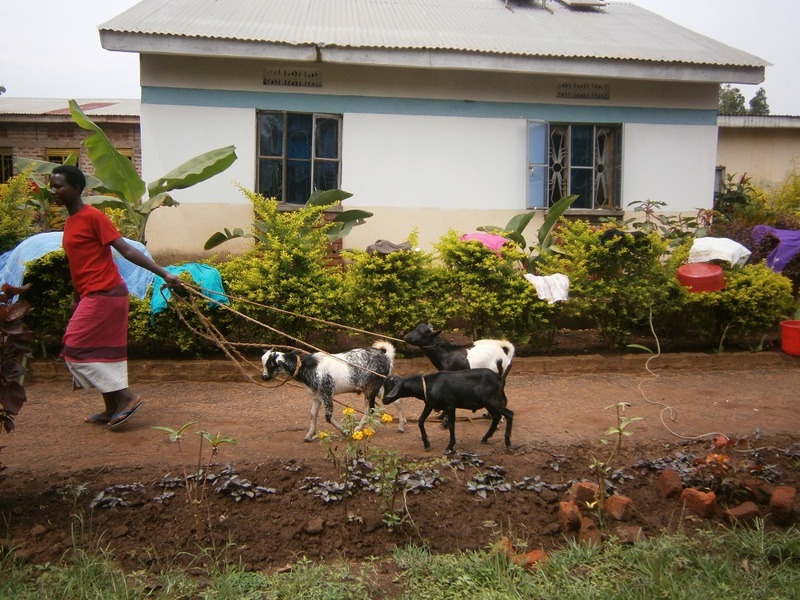 Runaway goats – As there are no children here to do the chores Ruth takes the goats out and tethers them where they can eat freely without eating the crops and then brings them back at the end of the day. 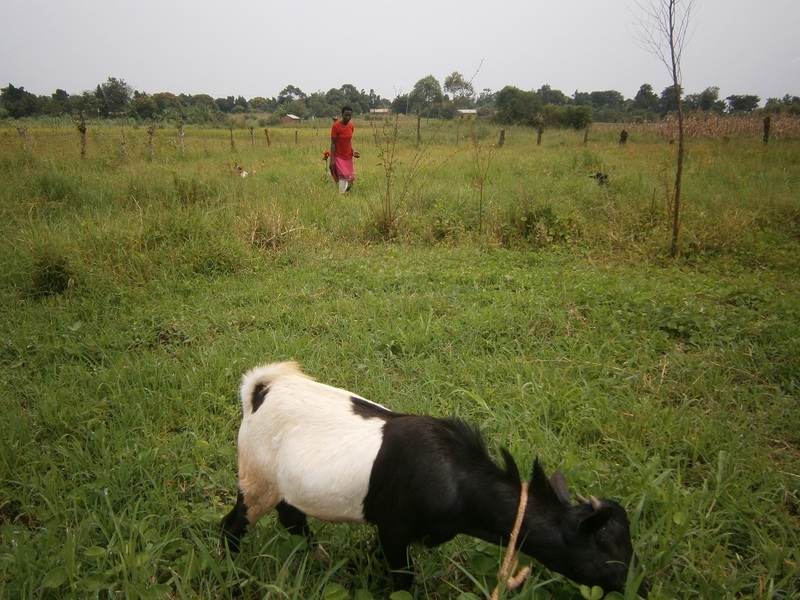 Last night James and I were about to sit down for supper when he burst in and said a goat got loose and headed out of the compound towards neighbours crops so the rush was on to get it back before it did any damage. He told me to carry on with my meal and he would have his later. Never guess what the meal was – goat! Not one of ours I hasten to add! Then this morning I was sat in Gerry’s Square under the mango tree when Ruth came past with the goats again but one did a runner again. Fortunately the main gait was closed. James had gone out for one of his many meetings so I thought I would just have to assist. I followed the goat through the field of sweet potatoes, rather gingerly as the heaps of soil around each plant was surrounded by water from the recent storm! I had several attempts to tread on the rope attached to the goat (something I have learnt to do when passing tethered goats, you never step over the rope!) but his beady eyes saw me first. In the meantime Ruth was securing the other goats and was grinning at what must have been a bit of a spectacle – Mzungu chasing goat! This made me more determined so I had one more go and got him! I felt quite elated leading him over to Ruth! Another experience ticked off! Friendship bracelet? When I was here last year a lady stopped me in the lane greeted me excitedly in her own language and then took off one of the bracelets and gave it to me. I was surprised and delighted by her gesture and this evening I was just back from bathing when she appeared. I didn’t recognise her at first but James reminded me of the gift. Fortunately I had brought it back to Uganda with me and she was thrilled when I fetched it from my room. Many people here, adult and children wear this simple bangle and many of the children at Lower park School in Poynton bought one of the ones I took back last year, with their pocket money. I’ve not seen the glorious starlit sky for a few nights as it has been overcast, stormy and COOL! But before the weather changed I loved to go outside after supper and just gaze up. I take a chair and sit in the dark with only the sound of the croaking frogs emerging from the swamp and the critters in the trees. James has given up asking me why I like to sit in the dark, I don’t think quite believes how few stars we see in the UK by comparison. I also see numerous fireflies darting about and one landed on the grass beside me, its light lasting well after I had got tired of staring at it. It reminded me of a few years ago when there was no ceiling in the library and creatures such as mice ran across the rafters above my mosquito net! I would hear the occasional plop when something would drop onto the floor! One night a single firefly got into the room and I laid there watching it, fascinated. I saw the silhouette of a gecko appear and suddenly the light stopped moving and then fell directly onto the head of my mosquito net only inches from me. I jumped at first thinking foolishly that the net might get on fire! Then curiosity took over and I turned on my torch to look at where it had landed on the floor and all there was to be seen was a beetle-like creature, its light probably put out for ever, ahh! I gecko had tried to catch it. It wasn’t firefly that gave me a shock on this recent occasion but the Askari. I suddenly felt his presence beside me! He had come on duty and was so quiet I hadn’t noticed him! Obviously he has good qualifications for being an Askari!